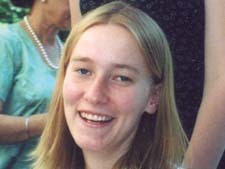 Rachel Corrie (April 10, 1979-March 16, 2003) was a member of the International Solidarity Movement (ISM) who traveled as an activist to the Gaza Strip during the Al-Aqsa Intifada. She was killed when she tried to obstruct an Israel Defense Forces (IDF) Caterpillar D9 bulldozer operating in a Palestinian residential area of Rafah that the IDF had designated a security zone. The circumstances of her death are disputed. ISM eyewitnesses say that the driver of the bulldozer deliberately ran over her twice while she was trying to prevent what they say might have been a house demolition. The IDF posits that the bulldozer driver did not see her; that the bulldozer was not engaged in a demolition; that Corrie was interfering with security operations designed to uncover tunnels used by Hamas and other groups for smuggling weapons from Egypt; and that the cause of death was falling debris pushed over by the bulldozer. Palestinians have a special place in their hearts for Rachel Corrie. She symbolized strength, perseverance, and self-assuredness. Conversely, she was labeled an enemy of Israel, a nuisance to the American government, and a target of ridicule by pro-Israeli propagandists. Fifty-eight years ago, my grandparents were dispossessed from their land in Palestine and this energetic little white girl from Olympia, Washington traveled half the world to try to fulfill their dream: the fruition of justice in Palestine. On March 22, a congregation of ardent supporters gathered at New York City's Riverside Church to commemorate Rachel's life and spread her words. Martin Luther King first chastised the war in Vietnam from this very church. The event arose out of controversy. The critically acclaimed play My Name is Rachel Corrie, which chronicled Corrie's work with the International Solidarity Movement (ISM) in Palestine through e-mail and letters (and had two sellout runs in London), was canceled by the New York Theater Workshop (NYTW). Just weeks after the cartoon controversy and the mass trumpeting of free speech worldwide, Rachel Corrie was being silenced. The NYTW attempted to crush her memory but her words live on. Other theaters have already expressed interest in putting on the show. A number of brilliant speakers came out to show solidarity in the name of human rights and justice. Democracy Now's Amy Goodman opened her speech with, "Welcome to this sanctuary of dissent. Dissent is what makes this country great." According to Arab American Institute president James Zogby, "She [Rachel], not George Bush was our liberator." Actress and activist Kathleen Chalfant said, "There is hope that this will turn into a triumph. [This will be] a model for political action." Rachel Corrie fought for the realization of peace in defense of those who couldn't protect themselves. Legendary poet, memoirist and actress Maya Angelou extended words of solace: "I love peace. For all peace lovers I send my condolences." Angelou went on to praise Corrie's valor: "I think we develop [courage]…Rachel had courage. Please develop that courage." In his speech, New York State Senate hopeful and Jewish activist Jonathan Tasani said, "It's our duty to speak out against human rights [violations] … One sided policy that ignores human rights and international law. It must stop now!" This message was reiterated throughout the night. Huwaida Arraf, co-founder of the ISM, argued that this was not about Muslims vs. Jews, but simply Occupation vs. Freedom. She said, "We must believe that we can challenge and defeat the 3rd or 4th strongest military in the world with our hearts and minds." Many of the speakers were touched on a personal level. Actress Najla Said, daughter of the late Palestinian-Amiercan writer and activist Edward Said, expressed amazement at Rachel's ambitious and steadfast mentality: "She went to Palestine … I've never stood in front of a bulldozer." The night eventually turned to the subject of censorship with speakers relating their personal experiences. Palestinian-American comedienne Maysoon Zayid spoke about being censored when she appeared on ABC's 20/20 with John Stossel and a group of other comedians. It was just after Rachel's death, so Zayid wore a shirt with a picture of Corrie on it to show solidarity and pay homage to her memory. Problems arose when Stossel realized Zayid didn't fit into America's concocted image of covered, oppressed and subordinate Muslim women. Clearly annoyed by her t-shirt, he barked at Zayid in the interview, "You could never say what you say in your country." Zayid snapped back, "What do you mean John? I say it everyday in my country. I was born in Jersey." To which he replied, "No I mean in your ancestor's country." Again she came back at him, asserting that she had performed a comedy show, "Live From Palestine," throughout the country. They went back and forth on the issue, Stossel apparently unable to believe that Palestine was anything but a haven for repressed, rock-throwing miscreants. When the 20/20 episode aired, Zayid's entire segment with Stossel had been edited out. At the commemoration, numerous speakers paid homage to the courage, love and strength shown by Rachel's parents, Cindy and Craig. Others offered their condolences and words of hope. Punk singer Patti Smith sang in a song she wrote for Cindy and Craig delivered via video, "Your tears were not in vein. But we both know we'd never be the same." She ended with a reminder: "The meek will inherit the land." As the show concluded Cindy and Craig took center stage. I was extremely moved listening them speak. These two spirited people have visited Palestine, continue to tour the country, and are relentless in getting their daughter's message out to the world. Cindy said that Rachel would "want to tell you the stories of Bil'in, the demonstrations, the Israelis that came to the wall to resist, the Palestinians in Gaza that are running out of food." Craig passionately appealed to the crowd, "Speak out, let it be known at home, at work, in Congress. Let them know!" Visit www.Rachelswords.org for more information and upcoming events. This article first appeared on Electronic Intifada.